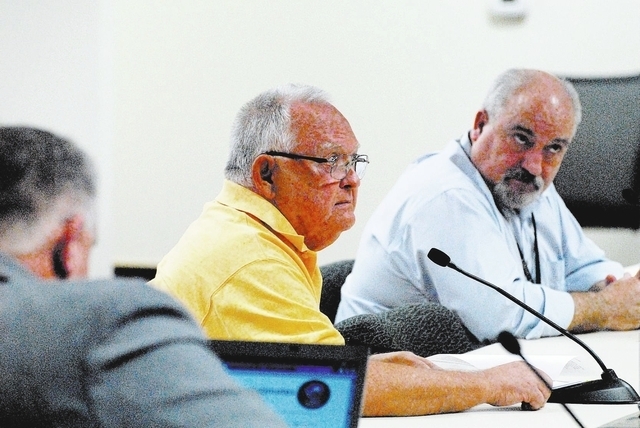 TONOPAH — Nye County commissioners Tuesday appointed three members to the county water district governing board and named new chairmen to three county boards. Commissioner Dan Schinhofen was appointed as the new county commission chairman replacing Butch Borasky. The chairman approves the agenda for the meetings, appoints liaisons, signs documents and runs the meetings, among other duties. Schinhofen was nominated by Commissioner Lorinda Wichman, who was appointed vice-chairman. Borasky was reappointed as chairman of the Nye County Licensing and Liquor Board, Commissioner Donna Cox was named vice-chairman. Commissioner Frank Carbone was appointed chairman of the Board of Road Commissioners, Schinhofen was named vice-chairman. The board adopted Carbone’s motions on the three water board appointments. He made a motion to appoint Pahrump developer Michael Lach to area four, the Pahrump representative, on the water board, replacing former chairman Tim McCall. Two other board members represent Pahrump: John MacLaughlin and Donna Lamm. Carbone nominated Jason Dixon of Round Mountain to replace Roberta “Midge” Carver as the representative from Smoky Valley, Currant Creek and Gabbs. Finally, Amargosa Valley Town Board member John Bosta was tapped to replace Lee White as the at-large member of the board. Rounding out the water board are James Eason, the Tonopah town manager, who represents Tonopah, Manhattan and Belmont areas and James Weeks, representing Amargosa Valley and Beatty. Lach told commissioners last November to do it right when setting up an advisory committee to draw up a Pahrump groundwater basin management plan and not panic over comments by the state engineer. He said county officials have a lot of liability if they stop people from developing their land. A Pahrump resident for eight years, Lach was an active bidder during the annual Nye County treasurer’s tax sale last spring. In his letter to commissioners, Lach wrote he’s a land and business owner in southern and northern Nye County where he worked for the past 10 years. Lach said he’s currently building a 96-room housing facility with 20 recreational vehicle sites in Tonopah where he owns more than 1,400 acres in Nye and Esmeralda counties. He said the future development plans include a small subdivision, service station and micro-hotel. Lach renovated the old Lambertucci RV park at the junction of Highway 95 and Radar Road for use by employees at the SolarReserve Crescent Dunes solar plant. A graduate of Indiana University, Lach said when everyone was pulling back on investments in Nye County in 2008, he doubled down, investing more. Bosta has been an Amargosa Valley resident since 2002 and said he has studied the groundwater issues in his basin. Bosta was one of a handful of Amargosa Valley citizens that collected the signatures on an initiative petition adopted by county commissioners to change the Amargosa Valley town board from an advisory board to an elected board with governing powers. He was elected to the Amargosa Valley town board during their first official election in 2012. Bosta’s resume states he was a teacher in Washoe County and Lassen County in northern California. He retired from the California school system in 1997, but continued to teach at Tonopah High School, and the Amargosa Valley Middle School until 2006. He graduated with a bachelor’s degree in 1963 and later a master’s degree in education in 1976 from the University of Nevada, Reno. Dixon’s letter states he was involved in hydrologic research on the Yucca Mountain project while in graduate school at the University of Nevada, Las Vegas from 1997 to 1999. He obtained a master’s degree doing hydrologic research at the then Nevada Test Site where he spent three years working for Bechtel Nevada from 1998 to 2001. Dixon was project lead for consultants analyzing water resources for the Yucca Mountain rail corridor project from 2005 to 2008. He is currently president of the Nevada Water Resources Association, where he has been a board member since 2008 and senior hydrologist for Round Mountain Gold Corporation. Dixon also owns a private consulting practice specializing in the application of Nevada water law for various projects. He has been a member of the Round Mountain town board since 2012. — Frank Maurizio, a retired Woodbridge, N.J. Police Department traffic homicide investigator and member of the Pahrump town board for two years, when he served on the Pahrump Nuclear Waste and Environmental Advisory Board. — Leroy Gren, a former Riverside, Calif. police department captain and chief of the Banning Police Department, who was a member of the Riverside Community College governing board for 18 years and taught criminal justice at New Mexico State University. — John Pawlak, a retired steelworker from Chicago who managed the Yucca Mountain Information Center from 2000 to 2005; was a subcontractor for former county hydrologist the late Tom Buqo; worked as a sewer plant operator for the Artesia water treatment plant; and sits on the boards of numerous organizations like the Pahrump Nuclear Waste and Environmental Advisory Board, Pahrump Fall Festival committee, Southern Nye County Conservation District, Public Lands Alliance of Southern Nevada and is chairman of the annual town cleanup and annual Earth Day event.